Finely dice onion. Cut each chicken breast into three equal-sized pieces. In a large saucepan, sauté onion in some vegetable oil over medium heat for approx. 3 – 4 min. until translucent. Add tomatoes and oregano to pan and cook for approx. 8 – 10 min. until sauce begins to thicken. Season with salt and pepper. In a large bowl, mix together Parmesan and breadcrumbs. Season with salt and pepper. In a separate large bowl, beat together two eggs until foamy. Using tongs, dip chicken cutlets into the egg mixture and then the breadcrumb mixture. Place on a plate and set aside. In a large frying pan, sauté chicken in some vegetable oil over medium heat for approx. 2 - 3 min. per side until golden. Set aside. Strain sauce through a food mill into a large bowl. 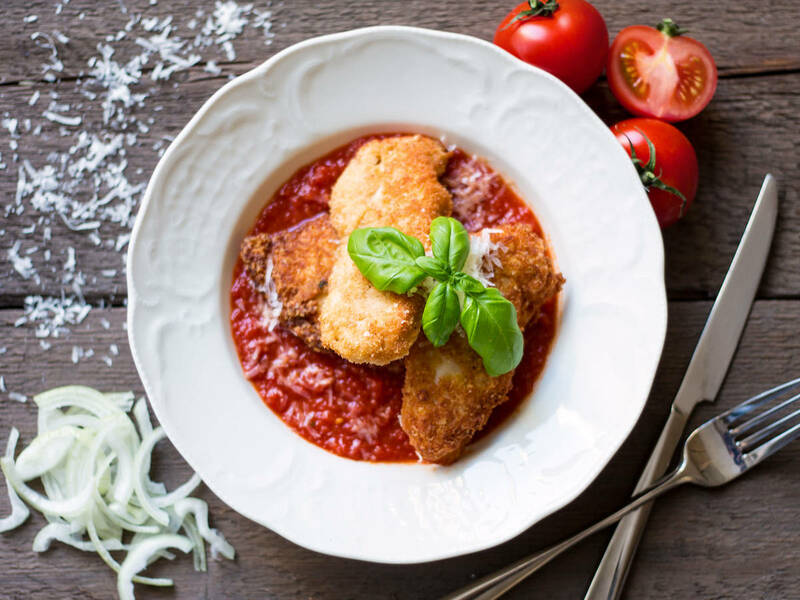 On a plate, layer tomato sauce and chicken cutlets. Garnish with freshly shaved Parmesan, if desired. Enjoy!